The second day was much colder than the first in Yellowstone. We set off to look for wolves and grizzly bears. After spending some time peering into the distance looking for wolves, we suddenly saw one running down the other side of the road, towards us. Our guide put the car into reverse and set off after the wolf, but had not gone far before realising that there was another car behind us. Sadly that realisation came when he hit the other car, which was pulled half on and half off the road, and was therefore in his blind spot. The need to swap insurance details meant we lost our chance to photograph the wolf. Fortunately, the only injury (other than to the car bumpers) was to the pride of our guide! “I’ve heard about people like you,” said the other driver, “who get all over-excited when they see the wildlife”. 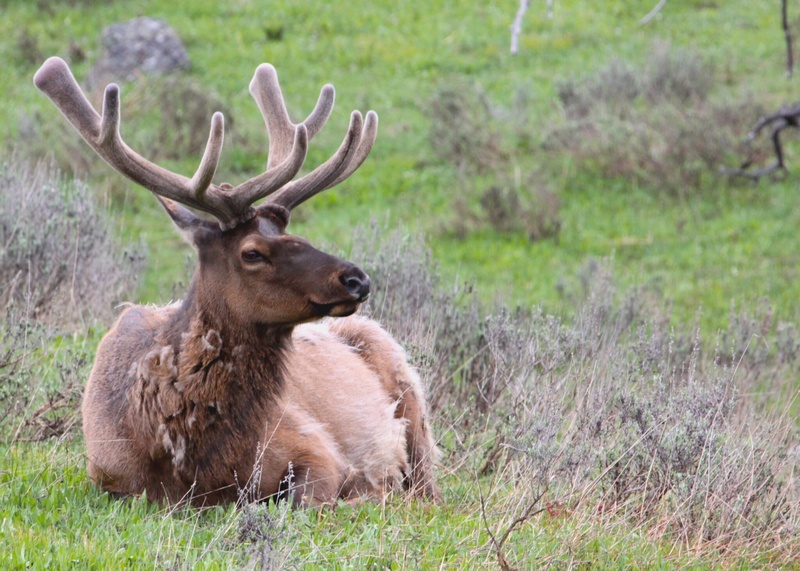 We then found a handsome elk lying by the side of the road. He will have shed his antlers over the winter. They are now growing back, covered in velvet, apparently at a rate of up to two and a half centimetres a day. 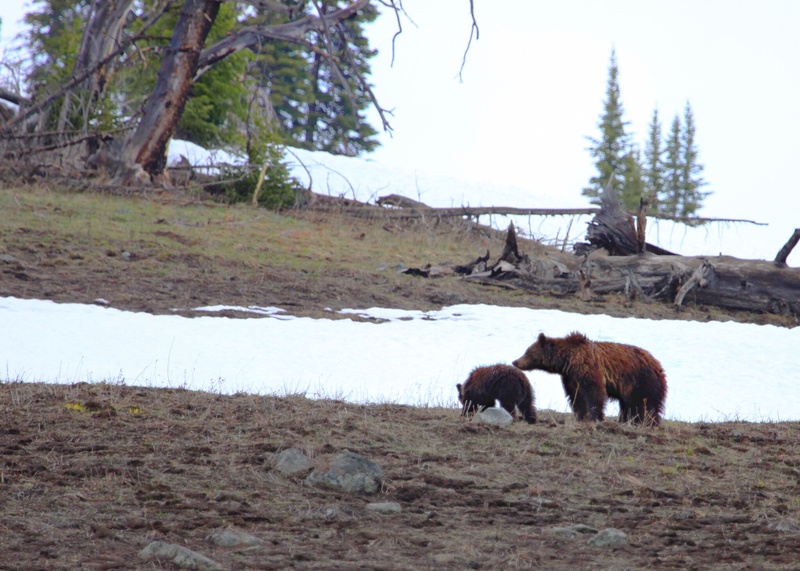 After stopping to photograph some of the sulphurous springs that steam malodourously throughout the park, we found a grizzly bear and her year-old cub foraging about 100 metres up a hill from where we stood. Much of the time the cub lay with his back to us, looking like a small and slightly hairy rock. Sadly they headed further up the hill. Hopefully we will get another chance to get some better shots. Not only were they quite far away, but the contrast of the dark earth and the snow was hard to photograph. That evening we headed out to look for bears again. We spotted a large male through binoculars, but he disappeared into the woods. 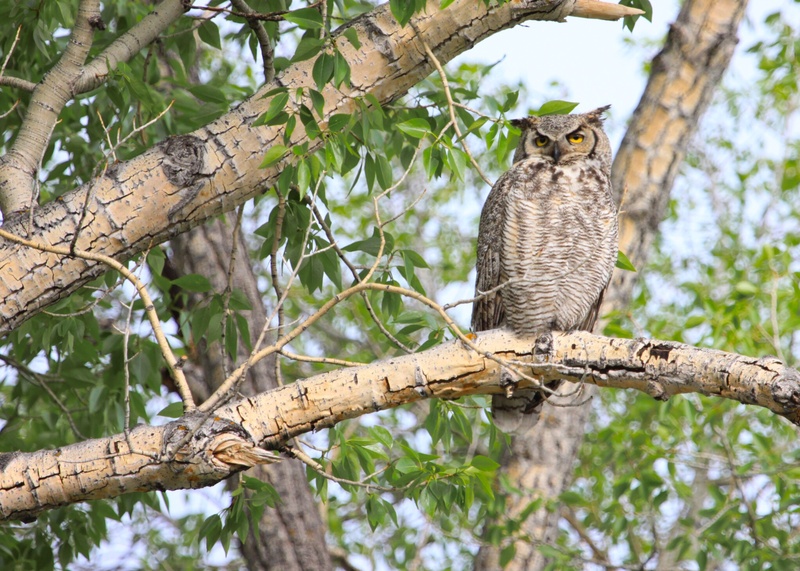 Heading into the little resort of Mammoth Springs, we had the chance to photograph a great horned owl perched in a tree. Periodically magpies turned up to try to chase him away, but a fierce glare from him was enough to scare them away. He has a nest with owlets nearby, and we will be back to try to photograph his kids. Also in the resort we found a clever mother elk who had realised that if she kept her baby close to people she would be less vulnerable to predators. 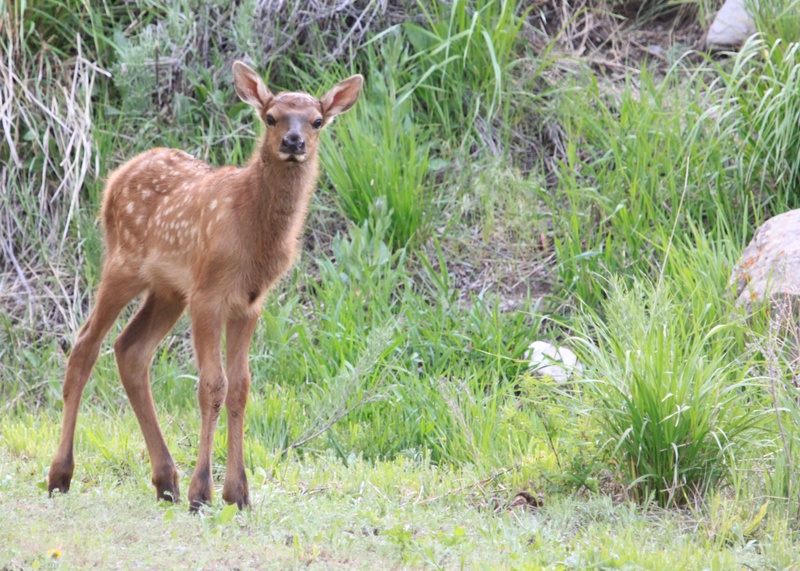 The fawn was so new she was still wobbly on her legs. 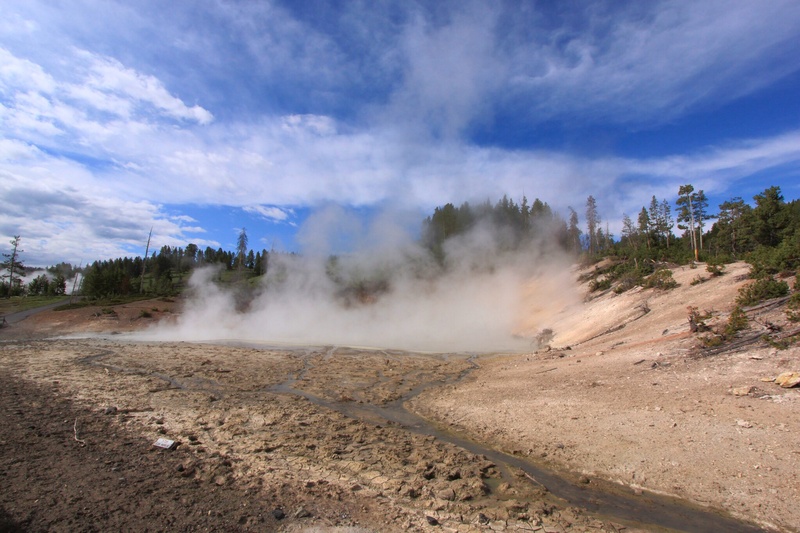 This entry was posted in Yellowstone on 02/06/2014 by paulaclarke. Sounds as if you are having a lot of fun! Hope you are learning a lot about your camera and how to make the most of it!